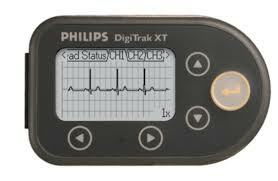 The Phillips DigiTrak XT is the newest model to accompany the company’s long history of reliable Holter monitoring products. The new Phillips DigiTrak XT has many improvements from its predecessors including smaller design, lighter in weight with extending recording capabilities. EASI Lead system provides superior diagnostic information with 12 channels (5 leads) of derived ECG.